Cape Town - Hank McGregor comes into the 51st Berg River canoe marathon in pole position to scoop a record ninth title in the tough 220km four day race from Paarl to Velddrif that starts on Wednesday morning on a Berg river swollen by a week of heavy rainfall in the region. McGregor feels the very full river and cold weather will neutralise any local advantage and make for an open and exciting race in which out-of-province paddlers will have more of a chance. "It's definitely thrown a spanner in the works for the local guys because all the tripping goes out of the window. There hasn't been much rain here at all this winter so no-one has been able to race the river as full as it is right now," said McGregor. "In conditions like these it all comes down to experience instead of local knowledge or ability in tree-blocks," he added. 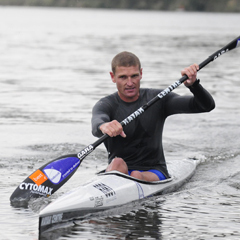 McGregor comes into the racer with a new Berg ally as his Team Best 4 Kayak Centre colleague Grant van der Walt will be working closely with his over the four days, even though he is a Berg novice. "It's a big advantage," said McGregor. "He is fresh to this style of racing. He is a big guy used to racing in swirling water. The full river means that we won’t be on the water as long as usual, so all in all the conditions will suit him, and we work well together." The Durban duo will however be up against a very strong elite men's field that contains every winner since the start of the new millennium, with McGregor mindful that the experience of the likes of Jacques Theron and Graeme Solomon will be a significant factor. "Never write off Lance King," he added. "He is always keen to take a chance and is a fighter. Simon van Gysen was in great form at the SA marathon champs as well so he will be a major factor as he has major speed and pace." Another iconic figure making his Berg debut is Dusi hero Thulani Mbanjwa, who will be racing in the colours of the Soweto SCARC Canoe club, and has been training at his home base at Nagle dam outside Pietermaritzburg for the tough ultra-marathon. The race starts with the traditional seeding time trial on Tuesday afternoon. However this year the time trials will take in a much longer 8km course above Paarl that introduces an intriguing element of the unknown. "Normally it is quite a shallow section of river with a couple of interesting islands, but with the river being so full that has all changed," said McGregor. "It will be hard and longer pull, and even though we will be starting a minute apart there will be lots of places where you will be able to see the paddler in front of you, which makes it exciting." Despite the full river conditions McGregor says this will be tough Berg and a complete contrast to the unusual conditions for the 50th anniversary edition of the race last year. "It's going to be very cold, and there will be plenty of places on the full river that represent opportunities to be taken," he said, "All this rain has got to go somewhere so I am pretty sure that by the time we get to the fourth day there will be a number of places where you can cut corners. But you have to know where you are going!" He added that the weather forecast for Saturday included a nasty 35 knot north easterly wind that will make life uncomfortable for the tired paddlers heading towards the West Coast. McGregor has the added boost of having his father Lee McGregor as part of his seconding team this year, the first time has been part of his son's backup team, since he started his undefeated reign of dominance in 2000. The women's race promises to be a focus of plenty of attention as double title winner Robyn Kime squares up to Olympian Jen Hodson, with the experienced class of Lisa Scott, Kirsten Penderis and Robyn Henderson jockeying for a place on the podium as well. The hardy annual debate has flared afresh about the rules that are intended to ensure that the women, competing for the same top prize money as the men, do not receive any outside assistance from other paddlers by riding slip waves. The race committee intends starting them in their own batch, separated from the elite men by the Berg Legends, and then setting them off in a batch behind the elite men's each day. The top women are asking for the right to start the race where they finish it each day, and if they have raced well enough to make elapsed time each day to be able to ride the wave of the male paddlers around them. Best 4 Healthcare has stepped in to sponsor the daily bridge prize hotspots which will add extra needle to each of the stages of the race. In the field are some iconic characters including the duo of Giel van Deventer and Andre Collins, who have both completed a record 42 Bergs and Jannie Malherbe, the race winner from 1963 and 1965. The Berg River Canoe marathon presented starts in Paarl on July 11 and ends at Velddrif on July 14.